Broadly speaking, the Earth has four layers: the solid crust on the outside, the mantle and the core — split between the outer core and the inner core. The crust is relatively cold (18-870 C), so it can crack, causing earthquakes.It’s thicker under continents (approx. 40 km) than under oceans (approx. 8 km). It’s composed of Calcium/Sodium/Aluminium-silicate compounds. It’s made up of plates, floating in a mantle. The mantle is the largest layer (2,900 km thick) , composed od hot ( approx 870 C at the top, 2,200 C at the bottom), dense rock (Iron, Magnesium, Aluminium, Silicon and Oxygen silicate compounds). Because of extreme temperature differences between the top and the bottom, it moves, causing the plates in the crust to move. The outer core is composed of melted, liquid Iron and Nickel, 2,400 km thick. As Earth rotates, the outer core spins to create Earth’s magnetic field. 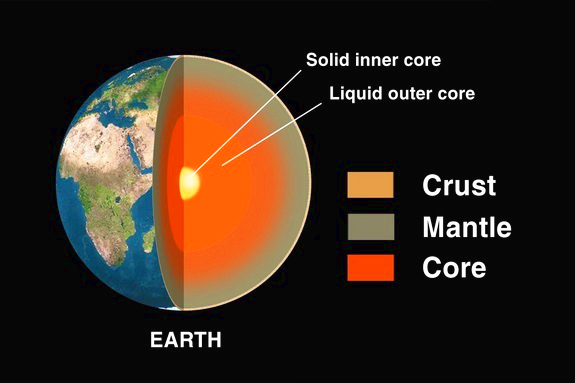 The inner core is 1,300 km thick, made of Iron, which remains solid due to extreme pressure. As solid, does not move or vibrate. The scientists haven’t been able to reach the center of Earth; we’re only able to drill down 12 km, because the high temperatures and pressure deform drills that are used. However, scientists are able to measure sound (seismic) waves produced by earthquakes, and this ishow the density of materials making up Earth is determined.